YAYAYAYAY!!! The mail came today with news from camp. I’ll confess to being delightfully stunned that Grey actually used any part of the stationery set he demanded as part of his camping kit. 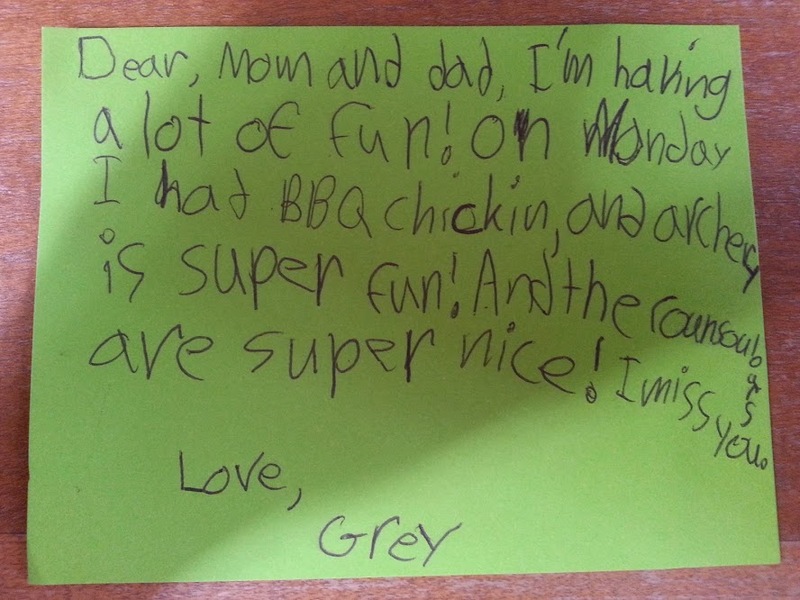 Not pictured is the front of the envelope, where in addition to the addresses, Grey included a note that “I went kayaking by myself” as well as a well-executed picture of him swimming. I have wondered 60 times a day how he’s doing. I still don’t have the full story, but I’ll take an update from Monday that includes BBQ chicken, nice counselors and a solo kayak trip! GO GREY! I pick him up tomorrow morning and I CANNOT WAIT for, as Paul Harvey says, “the rest of the story”.